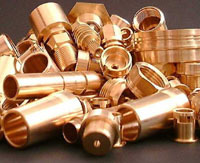 Currie & Warner Ltd are the longest-established turned-part manufacturers within the sub-contract industry, specialising mainly in the production of complex, high-volume, turned components in BRASS or COPPER-BASED ALLOYS, manufactured on 6-spindle automatic machines. Such parts are produced to the highest quality and environmental standards (ISO9002 and ISO14001). The production capacity is covered through more than 50 multi-spindle machines, ranging from 16.00mm up to 57.00mm diameters, though optimum competitiveness is best achieved between 20.00mm and 45mm. In most cases, economic-viability is reached when quantities exceed 50,000 pieces per annum, although quantities below this amount can sometimes also be viable, dependent upon the complexity of the part.